The Wildlife Society Government Affairs & Partnership program’s mission is to ensure that wildlife professionals, and the knowledge they provide, play an active role in the formation of wildlife management and conservation policies, laws, and regulations, thereby ensuring that these are scientifically-based and practical. 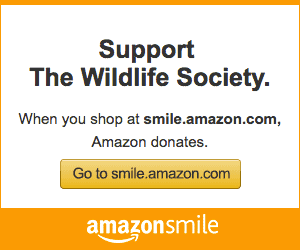 The Wildlife Society is designated as a 501(c)3 non-profit association by the IRS. Your donation supports The Wildlife Society’s efforts to sustain healthy wildlife populations and habitats for generations to come. Wildlife professionals make a difference every day through their work. Whether you’re looking for an internship, your first job or your next big career move, you just might find that opportunity in the TWS Career Center. Look for jobs and post your resume today! The Wildlife Society’s Awards Program annually honors professional excellence, recognizes outstanding achievement, and highlights contributions to wildlife science and management. Special recognition by TWS promotes the professional growth of our members, provides our membership with role models, and strengthens the image of our membership in the eyes of their peers, employers, our leadership, and society.